Newark, California - Penquills (formerly PhatWare Corporation), worldwide leader of award-winning handwriting recognition software and application development, is excited to announce the immediate availability of the Penquills iOS application, an advanced word processing, note-taking, and document management app. 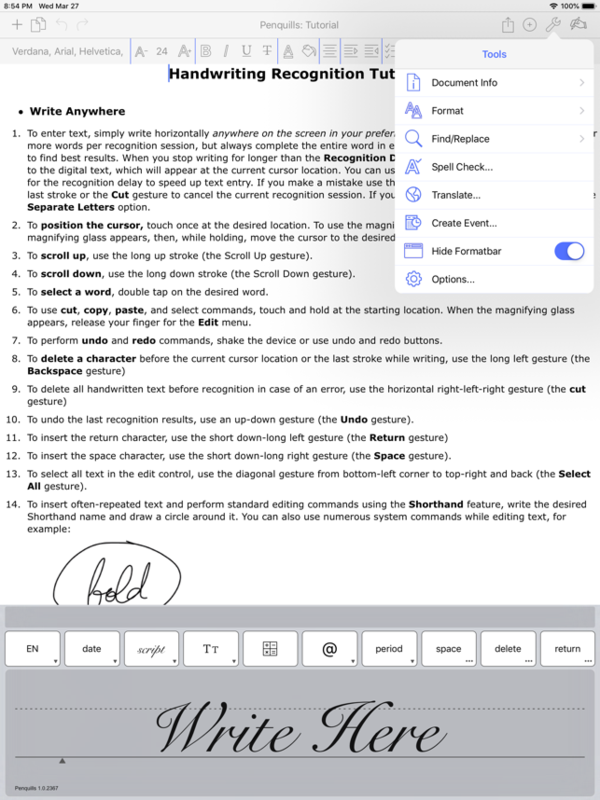 The app takes full advantage of Penquills's state-of-the-art handwriting recognition technology. Penquills offers a multitude of new features and enhancements designed to increase user experience and productivity. Penquills makes digital note-taking as easy as writing on paper. The app allows users to take notes by hand, and these notes are converted into digital text with Penquills's handwriting recognition software for natural, intelligent note-taking. You can now write emails in Gmail and even text messages by hand. Once the app has been downloaded, users can write in their own handwriting and have it converted to text in any iOS app that allows text input. Penquills's handwriting recognition technology has a spell-checker with its own custom dictionary, a context analyzer, auto-corrector, and a Shorthand feature that fills-in frequently used words and phrases. Propelled by the success of its handwriting recognition software, Penquills is now optimized for iOS 11 and 12 and includes a custom keyboard that offers handwriting recognition input in any iPad and iPhone app. A "today" screen extension allowing quick access to recent documents, and improved iCloud integration for easy document sharing between devices. Penquills/PhatWare first entered the world of handwriting recognition and software development over twenty years ago when Stanislav Miasnikov, a physicist and tech enthusiast, saw major flaws in the UX and operation of mobile software and sought to improve their performance capabilities. What started as a one-person business has launched a global brand that leads the field of handwriting recognition and mobile notetaking applications. The company's handwriting recognition software took on new life when the founder's son was diagnosed with dyslexia. For many young students who struggle with dyslexia, writing by hand has proved useful when it comes to improving other skills such as spelling, memory, vocabulary, and reading. Penquills's handwriting recognition helps dyslexic readers and writers practice their handwriting by seeing it convert immediately into digital text, retraining the brain to learn letters more effectively. From the beginning, Penquills's mission has been to develop cutting-edge software using the latest development practices in combination with world-class engineers. Upon achieving global recognition for the company's groundbreaking software, the brand has sought to improve upon its Penquills application. Penquills, which builds upon the original WritePad app, adds rich text editing which can be combined with images, custom drawings, and text. The app integrates with various system resources including email, contacts, maps, iCloud, social networks, and more. Penquills creates HTML and PDF documents and can open text, Microsoft Word, RTF, HTML and text files for editing. The app offers superior integration with online language translators to support collaboration with users across the world. Penquills offers advanced shorthand features for efficiency, which enables users to format text using written commands. Users can scribble shorthand commands to change the font, paragraph, and formatting in addition to inserting user-defined text blocks, invoking translators, maps and other system resources. To enable collaboration, Penquills HTML documents can be synchronized with Box, Dropbox, Evernote, Google Drive, iCloud, and Microsoft OneDrive. Penquills, formerly known as PhatWare Corporation, is a company driven by innovation and consumer ease. As a market leading provider of handwriting recognition software for mobile and desktop computers worldwide, Penquills remains the leading choice for consumers and businesses who depend upon performance and powerful software products. Penquills specializes in handwriting recognition, digital ink, note-taking, and document management software development. Contact Penquills for discounts on education-related expenses, like using Penquills to power your classroom. All Material and Software (C) Copyright 2019 PhatWare Corporation. All Rights Reserved. Apple, the Apple logo, iPhone, iPod and iPad are registered trademarks of Apple Inc. in the U.S. and/or other countries. Other trademarks and registered trademarks may be the property of their respective owners.